The Starving Artist’s Diet is a humor book that takes a realistic look at contemporary artists and what they have eaten (or not eaten) to survive. It takes the issue of art and eating very seriously providing humorous truths we can all relate to. Obviously an artist can’t live without art, and eating is pretty important too. This is a book that celebrates artists, their work, and some of the crazy things they’re willing to do to keep creating. 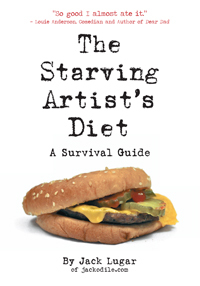 The Starving Artist’s Diet is an authentic look at artists and features their real stories. Jack Lugar is the world’s foremost authority on Starving Artist dieting. He is a writer, attorney, and the founder of the non-profit PROJECT: crEATe (artists fighting hunger). He has used his acerbic observational humor as a writer for Wanda Sykes’ show Wanda At Large and as a producer and writer for Louie Anderson’s Louzell Productions. Lugar lives in Indianapolis, Indiana with his wife, Elisabeth, and their three children.